New York Fashion Week is one of those things that is so preposterous and far out of my reach that it doesn't really phase me. It's like looking at someone's Instagram feed from their recent trip to Santorini or watching The Kardashians and their newest home purchase. Sure, it looks gorgeous and lovely and extravagant, but it's some nebulous concept that's so beyond comprehension (attending and wearing pieces from those designers) that I can't even get envious about it. Last year I pondered it a bit more and thought I'd wear this to one of the chaotic four days, but this year I sat around in a sports bra and deep cleaned my kitchen. I suppose in time, the fashions will trickle down. A bright print from Mara Hoffman will make its way into Target's $20 button downs. A prominent shoe color will start to pop up all over the place. A color palette will be re-envisioned, forgotten, then dredged up again for one of the revolving racks at Forever 21 next Spring. But for now? Those pieces, however glam (Monique Lhullier, for one), are far (like one-month's-rent far)out of my budget. Attending the events, however glam (with the gaggle of matching bloggers following), is far out of my budget/comfort zone/status/interest. Revisiting it on Instagram as some favorite stylists, photographers, blogger-attendees, and designers post is about as far as I'll get to it affecting my world. Just a few days of some blurry runway shots and a lot of instagrammed cab selfies. 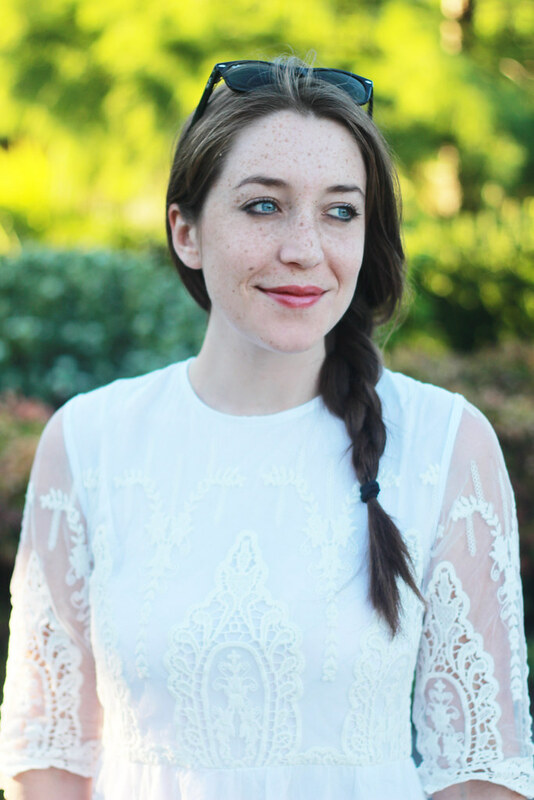 Instead of coveting a future-seasons future-expensive styles, I'm busy revisiting essentials in my own closet (still wearing white folks) and thinking about them for the oncoming cool temps. Fashion week and my giant Elle magazine dictating this Fall's styles (quilted, off-whites, Game-of-Thrones-y metallics, embellishments again) are going to have to serve as distant inspiration as I pull out last year's slacks, sweaters, and olive coats and try to re-work them into some semblance of stylish. What do you think of NYFW (attended or not) and what's your game plan for Fall? New wardrobe or carrying over pieces from last year? Oooooo great jacket! 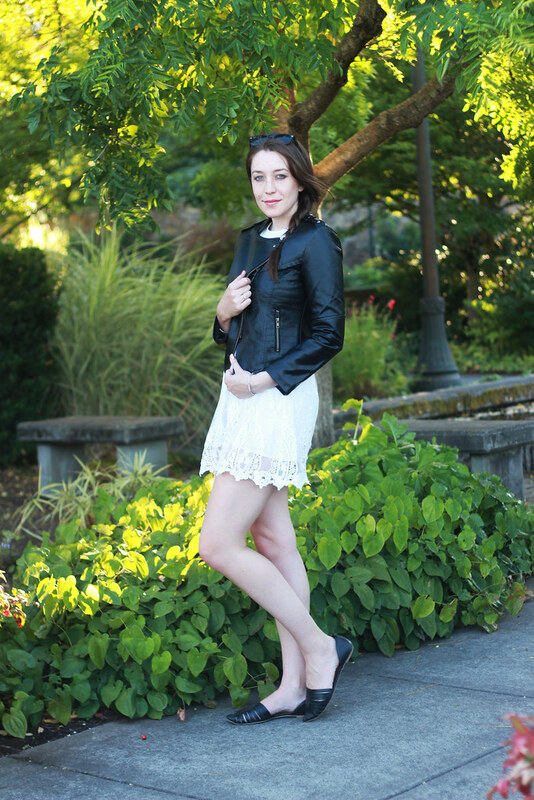 I love the contrast of the black leather with the feminine lace! I love reusing my old, last year's pieces with some new ones. I did get couple of new items already and will get a few more but in general, I'm all about reusing and mixing and matching with some new pieces. Also, I don't think that NYFW is bad in any way, we don't need to understand it or be part of it, but I think that it's a great event for all fashion lovers ( the REAL ones, not the cab-selfie posers ) and there're waaaay more weirder and surreal things happening in the world that should get more attention than NYFW, but then again, it's such a nice breath of "happy" air, that I don't mind all the flashiness and dollar signs. I love the unexpected combo of that dress and jacket! nice moto!! 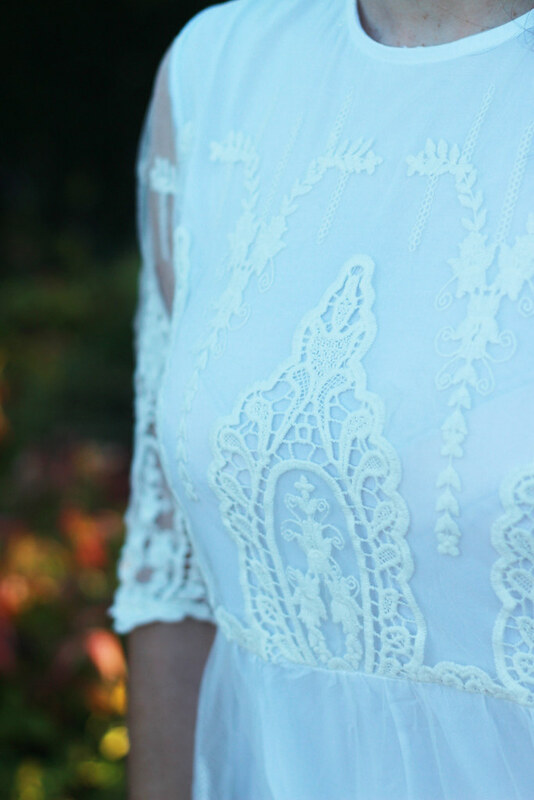 looks great with the soft lace dress! i'm always sick of nyfw before it even begins! I LOVE this outfit. You look so chic!!! 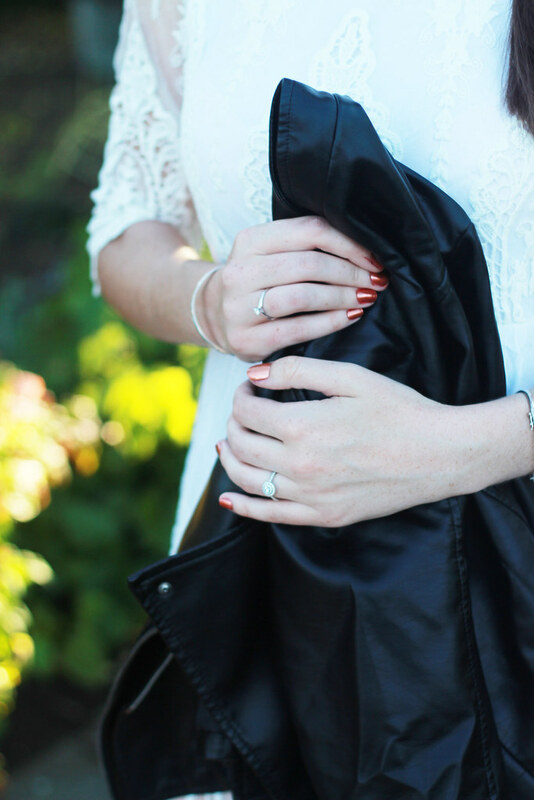 Love the play on lace and leather. i would love to attend NYFW someday. dunno if that will ever happen though. 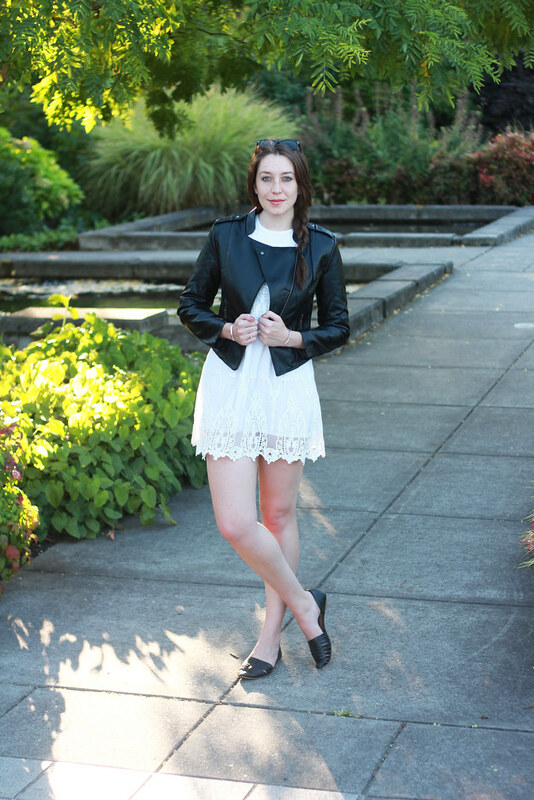 i'm struggling with fall this year because it is so freaking hot in portland still! i want to just get out all my fall clothes and wear them, but that gets tricky in 90* weather. i just want it to hurry up and be sweater weather already! I love this outfit too! 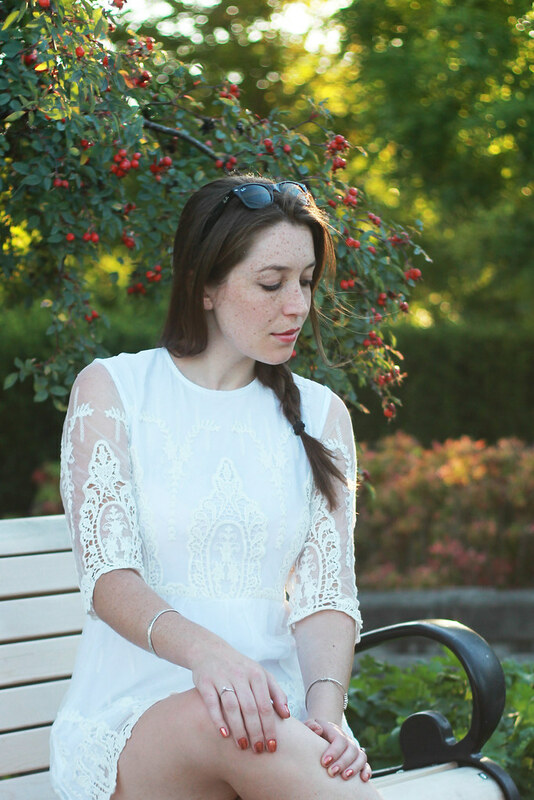 I need to wear all white (with 9 other ladies) for a bachelorette party in Montreal this coming weekend and I was trying to figure out how to style it since it is a white summer dress. The way you balance it with this leather is wonderful, I have to see if I can find something similar to style my white dress! Thanks for the guidance! 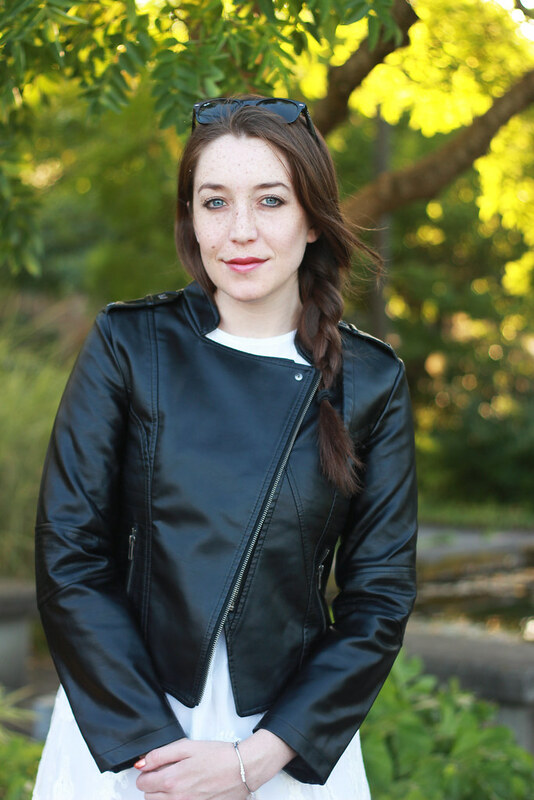 I love how the leather jacket instantly took this dress into fall. A great transitional look, and I bet you would super chic at fashion week! It's been a dream of mine for years now to attend... But you've got to live life and at the end of the day whether you make it to NYFW or not.. you'll probably still run to Walmart on a Saturday for paper towels... or maybe that's just me..
thank you for this post! the way you described NYFW being so far out of reach is perfect. i absolutely love the lace dress you're wearing here. i'll be remixing a lot this autumn (as always) and hopefully adding in a few carefully selected purchases. Loving that jacket! I really like pairing it with a frilly dress like that. I would never have put that combo together but I love it. Such pretty embroidery. Love this dress. You look so pretty. 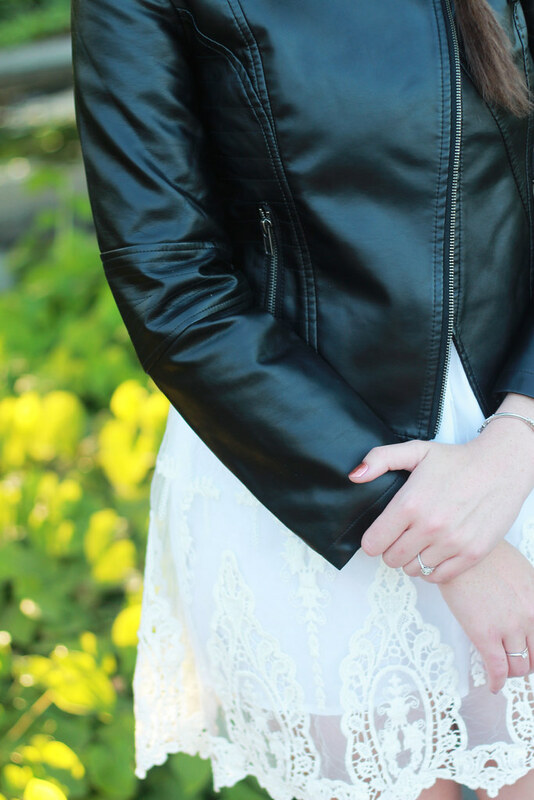 dress + leather looks amazing on you! I don't know why but I totally do not want to go to NYFW. I know, I know, but something about it just doesn't feel like I would really enjoy it. I do love the behind-the-scenes look though!